The sixteenth child of a seventy-seven year old Kent publican, Harry Relph was born with six digits on each hand. From his earliest professional performance, at a Gravesend pleasure garden in 1880, his deformity and lack of height (four feet six inches when fully grown) were emphasised for publicity reasons, although he always resented being promoted as a grotesque. Billed initially as Young Mackney (after the famous black face performer G.W. Mackney) and later as Little Tichborne (an ironic reference to the grosly overweight claimant to the Tichborne fortune) Harry proved himself to be an inspired comedian and a dancer of genius. By the time of his London music hall debut in 1884 his stage name had become shortened and he had developed a speciality dance in which he appeared to defy gravity, either leaning forward at a precarious angle or balancing on the tips of 28 inch wooden boots. Three Drury Lane pantomimes, 1891-94, established him as one of Britain's foremost coemdians, and an engagement at the Folies-Bergère in 1896 was the first of many appearances in the French capital. Little Tich sang many comic songs and was a skilful instrumentalist, but his greatest successes were furiously energetic dances in which he often burlesqued artists such as Loïe Fuller and La Belle Otéro. The surviving film of the Big Boots dance, made by Clément-Maurice for the Phono-Cinéma-Théâtre in 1900, has been described by Jacques Tati as 'a foundation for everything that has been realised in comedy on the screen'. 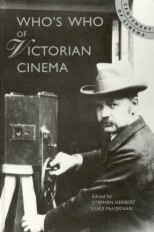 Despite his international fame he apparently only appeared in two certain further films: Pathé's Little Tich (1907), which features the Big Boot Dance, Little Tich as a horse guard, as a Spanish dancer, and as Loie Fuller in a Serpentine dance), and in the British cinemagazine Around the Town (1920), which features a scene from The Red Mill with Ray Kay and Little Tich. 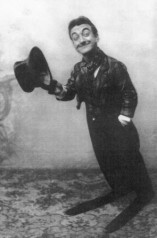 An imitator, Little Pich, made three films for Gaumont in 1902, and is probably 'big boots' performer who appears in Georges Méliès' Le Raid Paris - Monte-Carlo en Deux Heures (1905), a film long credited to Little Tich. The Big Boots dance was recreated by Sammy Curtis for a music hall scene in the Will Hay comedy Those Were the Days (1934).